Tanghalang Pilipino and The Japan Foundation, Manila join hands in the Philippine production of “MANILA NOTES” Manila, Philippines - Tanghalang Pilipino (TP) and the Japan Foundation, Manila (JFM), in partnership with the Cultural Center of the Philippines (CCP) present Manila Notes, a Philippines-Japan theater collaboration, staged as a TP 32nd season production from November 30 to December 16, 2018, Fridays, Saturdays, and Sundays, at 3PM and 8PM, at the CCP Tanghalang Aurelio Tolentino (Little Theater). The play is the adaptation of Tokyo Notes, written by internationally acclaimed Japanese playwright and director Oriza Hirata. The play is one of the most critically acclaimed works of Hirata, which has been translated into 13 languages for productions in many cities around the world. The play has also created artistic collaborations and cultural exchanges through adaptations such as Seoul Notes (2004), Taipei Notes (2017), and Bangkok Notes (2017). To make sure that the Japanese material communicates well with the local Filipino audience, the Palanca Hall of Fame writer Rody Vera has been working with Hirata on the adaptation together with the twenty (20) leading Filipino actors. Hirata introduced to the actors his acting style called “contemporary colloquial theater theory,” which is entirely different from Western acting techniques. This technique, created by Hirata to counter the traditional loud theater seen in Japan, has been received by the world to great acclaim. This, apart from the stellar cast and artistic staff, gives the audience another great reason to watch this acclaimed production. The artistic team, actors and production staff have been actively involved in the process of creating a brand-new type of theater practice through workshops, rehearsals and discussions. Lastly, the set design is also a collaboration by an acclaimed Japanese set designer, Itaru Sugiyama and select theater practitioners and students in Manila. 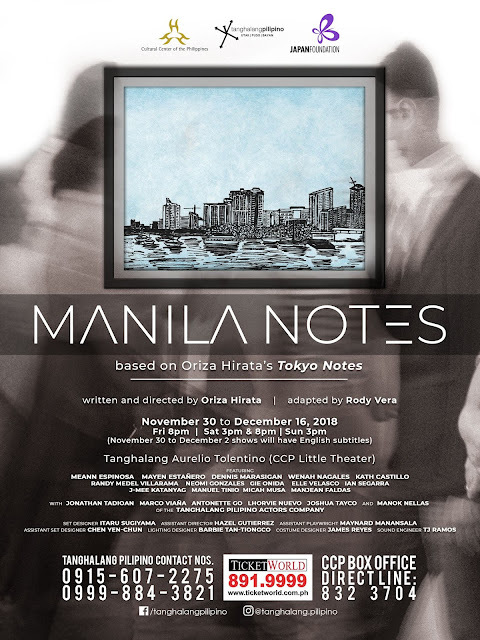 Manila Notes boasts of the some of the most versatile performers on the Philippine stage today: Meann Espinosa, a Philippine Educational Theater Association (PETA) actor, and Mayen Estanero, a TP Actors Company alumna, lead the cast, which also include some of theater’s finest: Former TP Artistic Director Dennis Marasigan, Gie Onida, Ian Segarra, J-Mee Katanyag, Neomi Gonzales, Wenah Nagales, Kathlyn Castillo, Randy Villarama, and Elle Velasco. Together with them are some of the members of the TP Actors Company: Jonathan Tadioan, Marco Viaña, Lhorvie Nuevo, Antonette Go, Joshua Tayco and Manok Nellas. The young, talented actors from different universities, Micah Musa from UPLB, Manuel Tinio from De La Salle University, and Manjean Faldas from the DLSU-College of St. Benilde, complete the cast. These actors were carefully selected after an open audition last September, conducted by Prof. Hirata, himself. Tanghalang Pilipino is the leading exponent of Philippine theater and the resident theater company of the Cultural Center of the Philippines. Tanghalang Pilipino envisions raising Philippine theater to heights of professional and artistic excellence, dedicated to developing and training actors, playwrights and designers with special emphasis in the production of original Filipino plays. By staging plays from the repertoire of Philippine past and plays in translation from other countries, TP hopes to bring to the experience of both artists and audience the best of Philippine and global theater tradition. Tanghalang Pilipino maintains a regular training program for actors through its Actors’ Company. The only one of its kind in the country, the Actors’ Company is a pool of professional theater actors who go through intensive training in acting, movement, dance, voice, script analysis, improvisation, directing and other production-related courses. Members of this prestigious and privileged group are among the most respected artists in the Philippine theater, television and film communities. Now on its 32nd Season, Tanghalang Pilipino promises to present high-caliber productions celebrating the Filipino artistry in the next years to come.